Getting to the Kvai River Lodge, located in the Great Bear Rainforest deep in the heart of Haíɫzaqv (Heiltsuk) Territory, is no simple matter. The journey presented many pedagogical opportunities for reflecting upon the importance of relationships. We gathered at Kvai in June 2018 to meet and work with representatives of our second cohort of the RELAW (Revitalizing Indigenous Law for Land, Air and Water) project. The cohort includes the Taku River Tlingit First Nation, Kitasoo/Xai’xais Nation, Ktunuxa Nation, Toquaht Nation, and the Haíɫzaqv Nation. Koeye (traditionally spelled Kvai and pronounced "Kway") is a place to come together for learning and sharing. It is operated by the Qqs Projects Society, a nonprofit society created by and for the people of the Haíɫzaqv Nation, dedicated to supporting their youth, culture and environment. First we gathered in Bella Bella, where two of the Haíɫzaqv people we work with met us at the airport with their trucks to take us and all our gear to the dock where we'd meet the charter boat. At the dock we waited together for the boat. As we waited, we renewed acquaintances, shared snacks and stories. When our boat arrived, we helped load it with all the gear, food and supplies we’d need for the next four days. The dock was wet and slippery, and we had to clamber awkwardly in and out of the rocking boat. We learned that the best way to load and unload the boat is not to simply pack our own bags onto and off the boat, but to do it together, forming a line from the dock to the boat and doing it “bucket brigade” style. Two hours later we pulled up to where the ocean meets the Kvai River. There is no dock connected to the shore, so we needed another boat and operator to pick us up. Kvai’s year-round caretaker, Chris (who always wears a belt with a big knife and a canister of bear spray), brought the aluminum punt over so all of us and our gear and our many boxes of food could be moved – this time from the charter onto the punt. Again, with much co-operation, we formed another bucket brigade over the short distance to the ramp and then again onto the pick-up truck that took everything up the steep driveway to the lodge. Finding "One-ness" means working together, building respect, enhancing relationships, and recognizing coalitions. One particular element for developing One-ness is in the recognition of having common goals. Here, our goal is getting us and our gear out of the rain as quickly and easily as possible. Since the waters we travelled upon would be the very subject matter of our discussions over the next few days, the journey became an important part of story and also an element of our place-based learning. Haíɫzaqv people taught us about the implementation and enforcement of their laws to respond to harms such as the Nathan E. Stewart diesel spill, direct action concerning herring, and monitoring of waters by the Haíɫzaqv Coastal Guardian Watchmen. It was significant that we talked and learned about the ocean while we were on and surrounded by the ocean. Being on those waters reminded me of what I’d learned earlier of the Māori, who had deliberately held their discussions about river personhood while in the river. On our first night, Larry Jorgenson, Kvai Executive Director, gave us an introduction and orientation including a tour of the cabins and amenities. These extraordinary buildings had been hand-built with love and care by former guests and friends who contributed their expertise. Larry knew where each piece of wood came from, and expressed appreciation for that tree’s beauty. That first night Larry also gave us some important reminders about bears – not just any bears, but iconic grizzly bears. He told us that 100 different grizzly bears had been identified at Kvai the previous summer. He also reminded us that Kvai is their home and warned us that when we step out the door in the morning, we should do so with grizzly bear awareness: there could be a bear on the other side of the door. We should develop an awareness that's outward facing, not inward; we should be constantly looking around us, staying vigilant of our surroundings. Larry told us the very cute and personable camp dogs are there for a purpose: to keep us away from bears (note: not to keep bears away from us). There is no cell service at Kvai and Wi-Fi is limited. The electricity, which is supplied by a generator, is turned off at 10:30 p.m. and as a result the place gets remarkably quiet and peaceful. Except the dogs. Outside the lodge the two camp dogs bark periodically throughout the night. Maybe they bark at bears? Over the four days at Kvai, I reflected upon reciprocity with the elements, the importance of the presence of children, a baby, beauty, poetry, waves, and water. Even though we were in a rainforest and it rained every single day we were there, our drinking water was carried into the lodge. At the end of the day when our workplace was full of used water glasses and some of them were half full, I was conscious of not wanting to waste. Someone had to pack in that water and it felt wasteful to dump it down the drain. Even though we were surrounded by trees, firewood still had to be cut, bucked, split, stacked, and carried. The work of keeping us fed, warm, safe and comfortable did not go unnoticed. Observing how our hosts care for that special space and for us reminds me of what Wedlidi Speck says about the importance of hosting from an Indigenous perspective. It’s all about building and maintaining relationships. Our place-based learning was built upon the relationship we'd developed with Haíɫzaqv through our partnership in the RELAW project. 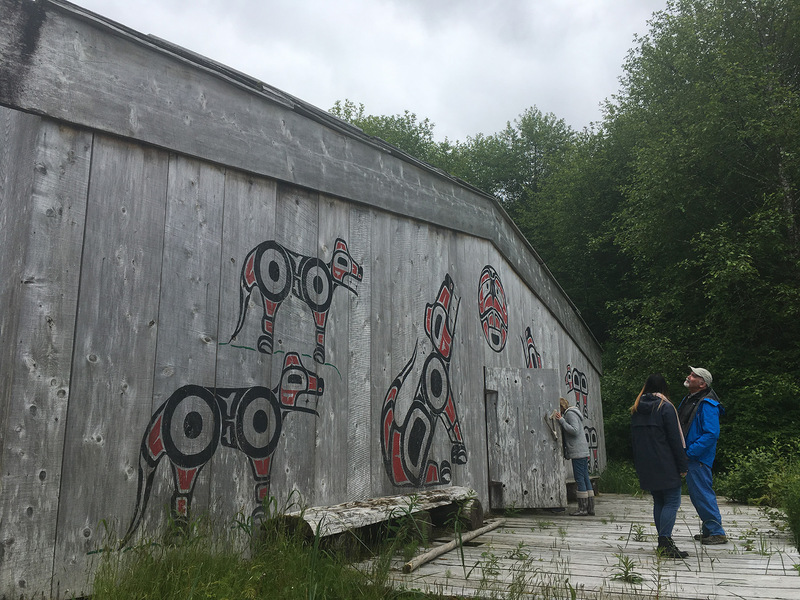 One of our team members, Lindsay Borrows, had spent a good part of a year travelling to Bella Bella and learning from Haíɫzaqv territory and people, including from Desiree Lawson, who led the Haíɫzaqv RELAW Project with deep wisdom and care. We paid attention to the elements – especially the wind – and noticed that our carefully planned schedule sometimes had to be re-jigged because of the very real connections with weather. This gathering at Kvai marks the last time our second RELAW cohort will be together. Currently we’ve put forward a call-out for Cohort 3, looking to build relationships with people and First Nations who’d like to explore their stories and laws and connections to their territories. Expressions of Interest from Indigenous nations and individuals interested in becoming partners in the RELAW project will be accepted until August 31st. If you’d like to learn more about the program and how to get involved, check out our RELAW page.